A. No, we are free. Q. How will you collect data for making my profile? A. In case you already have a website (not facebook, twitter), we can collect data from there, otherwise you can click on the link above "Create My Profile" and follow the instructions on the next pages. Q. How will people reach me on web through you ? A. As you register with us, we'll verify you information and create your profile. 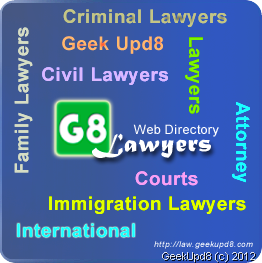 As soon your profile will be created on Geek Upd8, anyone can search your profile on Google, Yahoo etc. This is called vanity search. Q. What data you need for starting the process ? A. For a start all we need is your email, and a short bio. Just let us know who you are, where you did law studies, and where you are practicing. Later on we'll contact you to verify your profile.